The Miao are one of the 55 ethnic minority groups found in China and it is estimated that over 9 million Miao people live in China today. Yet the term “Miao” can sometimes be a little misleading as it actually encompasses a number of ethnic groups that are only loosely related by language. Although their languages all come from the Miao-Yao language family, their dialects are often mutually unintelligible and their customs can be vastly different. Roughly speaking, within the Miao ethnic minority there are 6 different languages and an estimated 35 different dialects. 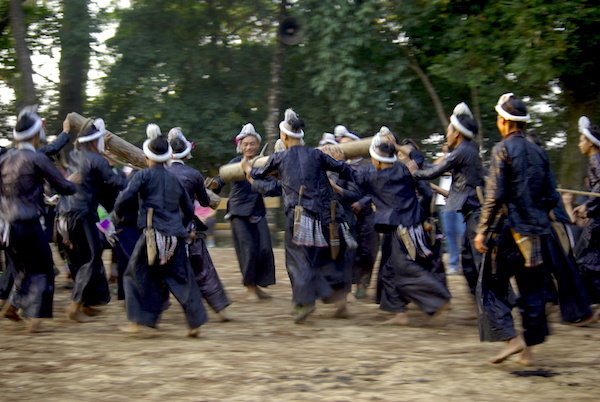 Yet many Miao groups agree that they share a common ancestry and celebrate many of the same festivals. The Miao can be further subdivided into the Hmong, Hmub, Xong (Qo-Xiong), and A-Hmao. These subgroups have been divided based on the general colouring of the women’s clothes within that subgroup. Hmong Miao have settled throughout south and east Yunnan, south Sichuan and west Guizhou and are often referred to as White Miao, Green/Blue Miao, or Small Flowery Miao. 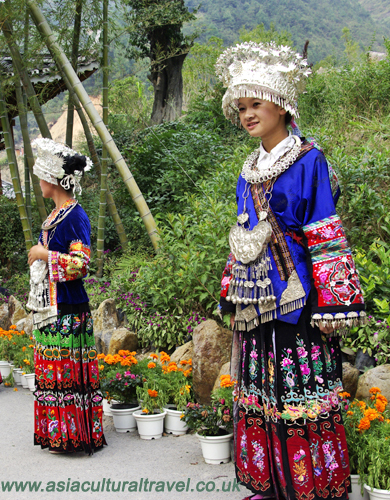 Hmub Miao are concentrated primarily in southeast Guizhou and are designated as Black Miao. Xong (Qo-Xiong) Miao are located in west Hunan and are called Red Miao. Finally, A-Hmao Miao, or Big Flowery Miao, can be found in west Guizhou and northeast Yunnan. Of these four subgroups, the Hmong Miao are the only group to have immigrated out of China and small pockets of Hmong Miao can be found in America, France, Australia and a few other western countries. Though these subgroups have distinct differences, they all agree on a common ancestry. According to legend, the Miao descended from the ancient Jiuli tribe, which was led by the quasi-mythical warrior Chiyou. In 2500 B.C. the Jiuli struggled against the Huaxia, who were the ancient ancestors of the Han Chinese, over supremacy of the Yellow River valley. Not long after this struggle, the Jiuli tribe were forced further south by the Huaxia until they eventually separated into the Li and Miao tribes. As there is no historical record or DNA evidence that supports this claim, no one really knows which tribe triumphed or if the legend is necessarily true. Nowadays it really depends on who you ask! Modern research, however, has given some credence to the legend. New evidence suggests that the Miao may have been among the first people to have settled in China. Researchers found that many words in Chinese related to rice farming were borrowed from the Miao language. This indicates that the Miao were likely among the first rice farmers in China. In the middle Yangtze River region, geneticists have also established a connection between the Miao and the Daxi, whose culture dates back approximately 5,300 to 6,000 years ago. The Daxi have long been credited as being some of the first cultivators of rice in China, meaning the Miao may have at least descended from or perhaps have been among the first settlers in China. If Miao ancestry dates back all the way to the founding of China, it is no wonder that, over time, they have developed into so many subgroups! The term “Miao”, however, didn’t appear officially until it was first used by the Han Chinese sometime before the Qin dynasty (before 221 B.C.). Thereafter it tended to be applied to what the Han Chinese perceived as “barbarians”, particularly during the Ming and Qing dynasties when the Miao people waged frequent rebellions against imperial rule. After the fall of the Qing dynasty, the Miao played a focal role in the history of Communist China by providing Mao Zedong with supplies and guides through their territory so that he could escape the Kuomintang during the Long March. In Miao culture, a village leader would normally be appointed to oversee each village, although nowadays these villages come under government jurisdiction. These village leaders still play important roles in the community, particularly in isolated Miao villages such as Basha. The average Miao village contains 100 to 200 households, although smaller villages have no more than 10 households and the largest villages contain over 1,000. Miaos have a reputation for living in mountainous areas so their villages tend to be perched on mountainsides or hillsides. They live in dwellings known as Diaojiaolou, which are wooden houses that are held up by stilts. These houses are normally two to three-storeys high. The front of the house is held up by pillars but the rear of the house is suspended on wooden poles, making it level with the mountainside. The ground floor, underneath the wooden poles, is used for livestock and firewood while the second floor is a general living space and the third floor is either a bedroom or an extra storage space. The houses are all built by villagers using local fir wood and they are a magnificent example of the craftsmanship exhibited by the Miao people. The Miao people are one of the oldest ethnic minorities in China and their fascinating customs, elaborate dress and remarkable festivals are a reflection of their enduring legacy. If you’re taking a tour though Guizhou, the Miao villages of Basha and Langde are certainly a must-see. Chiyou: leader of the ancient Nine Li tribe in Chinese mythology who is most famous for his fight against the Yellow Emperor during the legendary Three Sovereigns and Five Emperors era. Although the Han Chinese view him as a tyrant, the Miao people venerate him as a wise and noble king and sometimes worship him as a deity.